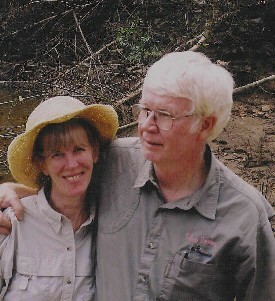 Uvalda, GA--The Fellow Travelers tried new territory for the September, 2003, voyage. 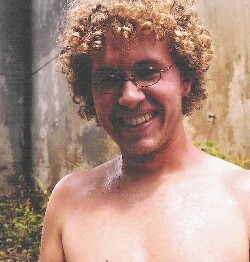 J oel Shiver, a relative newcomer to the group but a veteran paddler, arranged the itinerary. On September 4, Margie Massey, Diane Stines, and Charlie Stines loaded a couple of boats onto the Suburban Profane and headed north toward Soperton to meet up with Art Shelfer, Joel Shiver, J.D. Shiver, and John Williams at the GA 46 bridge vaguely in the Soperton area. After shuttling some vehicle to the anticipated take-out at Gray's Landing on the Altamaha, the canoeists loaded up. John soloed, and everyone else paired up for the trip. The put-in was beneath a picturesque bridge and was sticky muddy. But all were afloat by shortly after eleven. The Oconee water is not especially pretty. It is neither clear nor reflectively tannic, but is instead a brownish color. But the banks are outstanding. Althou gh the river is wide, it proved to be very shallow in spite of the abundant rainfall. 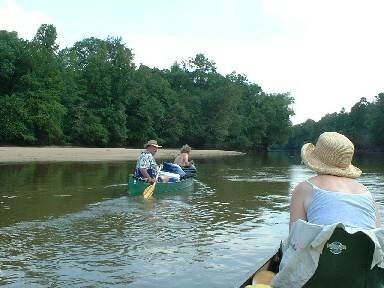 The sand on the Oconee is unlike that on the more southerly rivers, and is much coarser and not nearly so white. But the river twists through the countryside. An aerial map shows just how crooked the river is, and Joel pointed out that the main channel is constantly changing, creating many shortcuts. There are sandbars everywhere, and there is almost development on the river prior to reaching the Bell's Ferry area. 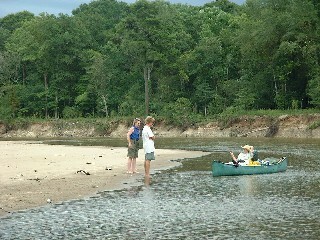 The sandbars provide campsites around almost every bend. T he water was pleasantly warm. Wading birds and ducks are plentiful. Due to the time the journey began, other wildlife was not apparent on the first day of paddling. After canoeing for a couple of hours, Joel decided we should take one of the shortcuts. This cut off a rather lengthy loop, and it involved very shallow water, some maneuvering, and a couple of pull-overs. It also provided a nice lunch stop, and a place for some of the gang to take a dip in the warm water. Once the shortcut was completed, it was back to traversing the main course of the Oconee. The GPS indicated that despite a lot of river miles, the group was not covering a lot of linear miles. Sometime around five a magnificent sandbar was just to inviting to leave behind, so the crowd stopped and pitched tents. Joel provided Thursday's night supper--grilled chicken, beans, and potatoes. Once that was eaten, John baked a pineapple upside-down cake. J.D. built a nice campfire. A few lies were swapped, and then it was bedtime. Just about the time everyone was in the tents, it came a vicious rain, but everyone stayed dry except Margie, who had first decided to sleep without the rainfly. She braved the rain and affixed it somewhat. The King got up about daylight and made a pot of coffee. Margie then prepared link sausage, scrambled eggs, grits, and Dutch oven biscuits for breakfast. Once the dishes wer e washed, the tents were taken down and the canoes loaded. It was time for the Friday paddle. Shortly after launch, a small deer entertained the paddlers by taking a swim. Then it was on down the river. Joel spotted and photographed an alligator on the bank. The weather was pleasant and not as hot as one expects in early September. The river was still devoid of houses and roads, even in the area of US 280. No one was in a bad hurry, and there was a nice lunch break on a sandbar. There was a little rain, but not enough to really bother anyone. 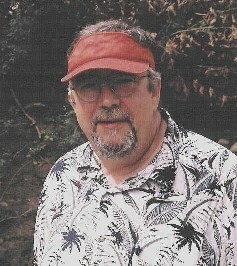 Joel was the navigator, and toward the late afternoon he concluded that we would be better to take out at the US 221 bridge which is about nine river miles above Gray's Landing. This would present no real shuttle problems since Donald May was planning to meet the group and could take them for the vehicles. A great campsite was found relatively early, so everyone was pitching tents before five. About the time the tents were in place, the rain did come. John brought his famous parawing, and it was rather crowded with seven people sitting underneath while Art and John practiced the culinary arts. Art prepared a beef and venison roast, and John made scalloped potatoes in the Dutch oven. John the baker made a strawberry shortcake for dessert. It was still raining, and raining rather heavily. The lies were told beneath the parawing, and finally everyone went to bed for a good night's sleep. It rained almost all night, but the rains ceased just before time to get out of bed. Charlie made his usual pot of coffee, and then fired bacon and pancakes for breakfast. John had enough strawberries left to really liven up the pancakes. The weather was heavily overcast, but there was no more rain. It was less than two miles to the Lumber City bridge at Bell's Ferry, and the river changed in that there were quite a few houses on the banks. There were several powerboats in the area, and the river was not nearly so isolated as it had been on the first two days. After passing the Lumber City bridge, it was on to the junction of the Ocmulgee. The Oconee and Ocmulgee meet almost head-on to form the Altamaha, and it is a big river, but still not a very deep one. There were several powerboats on this section, and quite a few fishermen. It was not a long paddle to the US 221 bridge, but there was an interesting railroad drawbridge on this section. 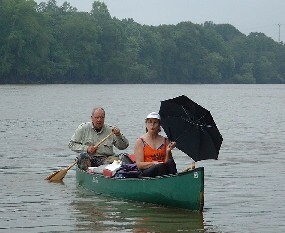 D onald and Gloria May arrived at the US 221 bridge about the same time as the paddlers. Donald took John back to the put-in to get his car, then took Charlie and Joel to Gray's Landing to get theirs. After loading the gear and boats, everyone drove to Gray's Landing for the real destination--Benton Lee's Steakhouse. James Turk and Lucy Gabriel also met the travelers for the lunch. Benton Lee's is locally famous, and it was a delight. Some ordered steaks, some quail, some gator, some frog legs, and some shrimp. The restaurant had a table large enough to seat all eleven, and it was a leisurely lunch flavored by really good conversation. Once the gluttons had finished, everyone headed home. 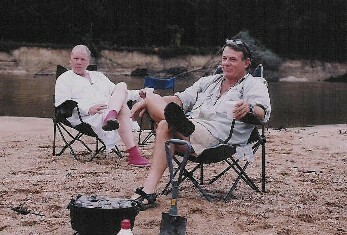 The trip was super, and all appreciate Joel for introducing the travelers to a different river.